SOUTHWEST ASIA (Aug. 15, 2004) -- Airmen in a back shop at one forward deployed location do work that goes largely unnoticed by everyone but pilots in the face of disaster. Members of the survival equipment shop are responsible for testing and maintaining the parachutes, rafts, escape slides, life preservers, survival suits and other equipment needed by pilots and flight crews should they have to land before their airplane does. Senior Airman Jesse Struk, 379th Expeditionary Maintenance Squadron, prepares a locator beacon to be inserted into an emergency parachute harness at a forward deployed location. Airman Struck is a survival equipment specialist and is deployed from Dyess Air Force Base, Texas. “We’re the last to let you down … that’s our motto,” said Staff Sgt. Kelly Dawson, a survival equipment specialist with the 379th Expeditionary Maintenance Squadron. The survival equipment shop recently moved into new facilities that offer the team more space to complete their mission. Parachutes are probably the most visible product to come out of the survival equipment shop. The packs are opened on a long table in the new inspection room so individual components like the harness, lines, canopy and pilot chute can be inspected for damage. Each line is checked to ensure there are no tears or frays. “If a line is damaged, we may have to send the parachute back to the manufacturer or even retire it,” said Senior Airman Jesse Struk, 379th EMXS. 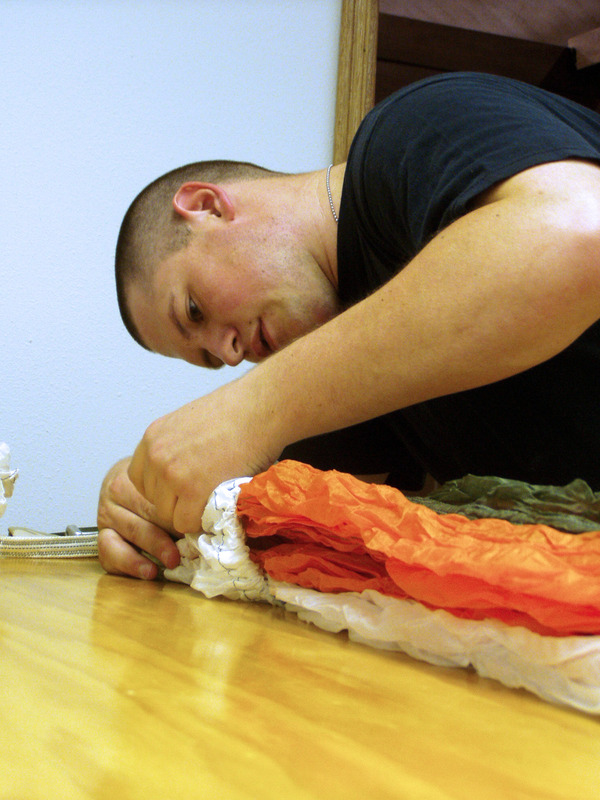 After a technician inspects and repacks a parachute, he signs his name to it. That signature is a guarantee to a pilot that his parachute will work when he needs it. That kind of pressure might keep some people awake at nights. But if you do your job right, Sergeant Dawson said, there is no need for stress. Senior Airman Jesse Struk, 379th Expeditionary Maintenance Squadron, uses a curved sewing needle to prepare an emergency parachute for operational use. Airman Struck is a survival equipment specialist at a forward deployed location. He is deployed from Dyess Air Force Base, Texas. An orange raft, about 20 feet across and that seats as many people, lays deflated and in a heap on the floor of the new survival equipment shop. The raft is one of four that would normally be stowed under the wing of a C-130 aircraft. Tech. Sgt. Kraig Schroeder, 379th EMXS, hooks the nozzle of an air compressor into the raft. It takes about 10 minutes to fill the raft with the compressor. If the raft were actually deployed from the underside of a C-130 in an emergency, it would fill much quicker. “With the carbon dioxide cylinder installed, it could inflate in as little as 30 seconds,” Sergeant Schroeder said. The raft is left inflated for up to four hours to ensure it maintains pressure. After the inspection, technicians deflate the craft and fold it into a bag. The bag must fit neatly into a metal form that matches the cavity in the wing of the C-130 where the raft will be kept. The rafts are inspected once a year, Sergeant Schroeder said. The survival equipment shop also tests the smaller rafts used by fighter pilots. The smaller rafts are equipped with an inflatable top designed to keep pilots warm until they are rescued. The top isn’t automatically filled by the attached CO2 container, however. Pilots must fill it using their lungs. Staff Sgt. Jessee Patterson said that to expedite a pilot’s rescue at sea, the underside of the inflatable top is colored day-glo orange. 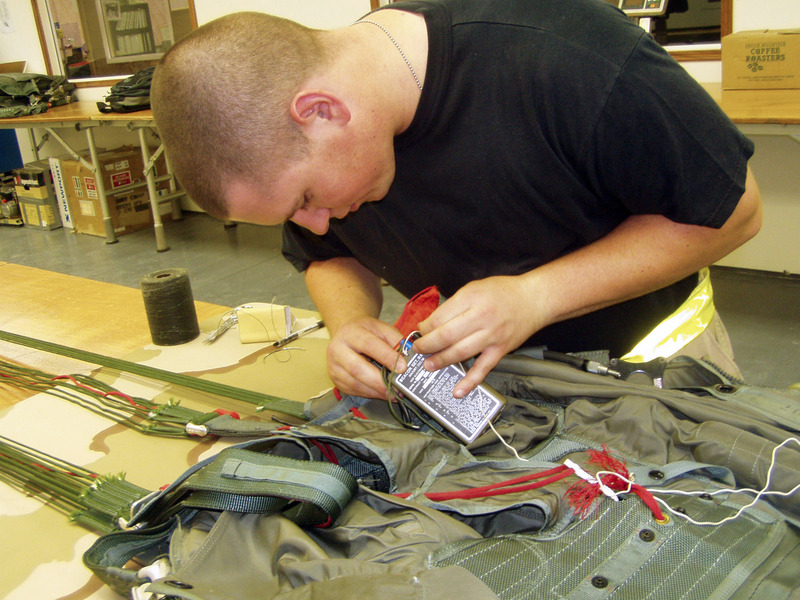 While not packing parachutes or inflating life rafts, the men and women of the survival equipment shop put to use one of the skills they learned in technical school — sewing. Senior Airman Jesse Struk, 379th Expeditionary Maintenance Squadron, inspects an emergency parachute. As part of the inspection, he checks the lines, the canopy, the pilot chute and the harness for tears, abrasion or other damage. Airman Struck is a survival equipment specialist and is deployed from Dyess Air Force Base, Texas. They don’t always sew survival equipment, however. 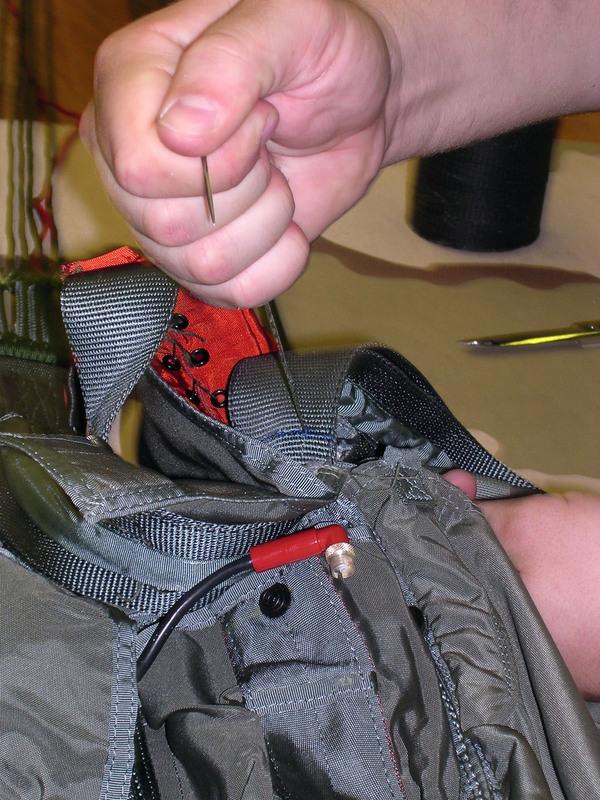 As a part of the fabrication flight, survival equipment specialists can be tasked to sew just about anything. Sergeant Dawson said the sewing part of the job is a welcome departure from the by-the-book procedures usually involved with survival equipment. Sergeants Dawson and Schroeder say they may sew anything from soundproofing for C-130 aircraft to covers for conference room tables. Still, gratitude garnered from making a camouflage cover for a conference room table doesn’t compare to that which comes from somebody who’s life you may very well have saved by packing their parachute correctly, or ensuring their survival suit didn’t have a hole in it. “You can really see somebody’s appreciation when they tell you ‘if you hadn’t done your job right, I wouldn’t be here today,’” Sergeant Dawson said.